The sword in the stone. The white whale. The custom pizza box design. Eschewing nondescript terms like Hot! 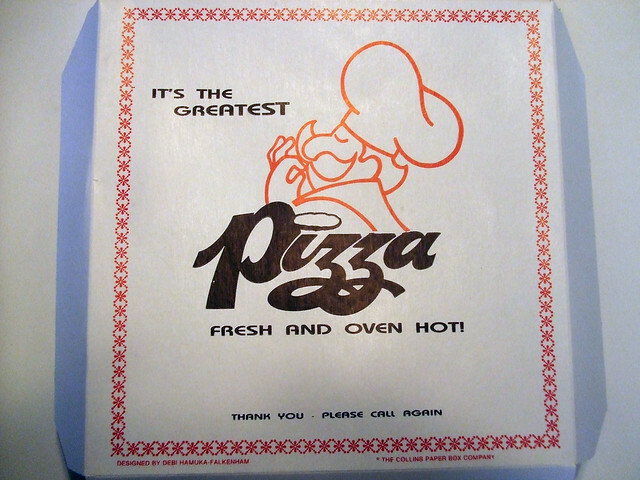 or Fresh!, this snazzy blue-and-white box proudly identifies itself as emanating from – and only from – Four Brothers Pizza Inn. 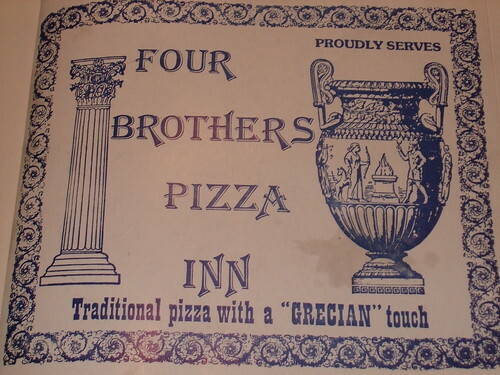 In addition to the “Greek flag” blue ink and Corinthian column, the box tells us to expect pizza with a “GRECIAN” touch. Unnecessary quotation marks aside, Four Brothers Pizza Inn is, indeed, pretty boss. We found the place while driving back from an antiques auction in the middle of a hurricane, an experience that proves that we a) have inherited the hobbies of 65-year-old eccentrics b) suffer from poor planning. In the midst of navigating half-flooded country roads, we managed to sneak in bites of the surprisingly tasty takeout — consisting of margarita slices and an (even tastier) Greek salad. The box even doubled as a makeshift plate — gracefully catching a glob of Greek salad dressing that, courtesy of a rain-filled pothole, was destined for my lap. Rating: I’m giving both the box, and the pizza contained therein, a win. The box was functional and interesting (a grecian urn and the use of unnecessary quotation marks? jackpot.) and the pizza was delish and would have provided life-saving sustenance had we gotten trapped in a natural disaster (it ended up stopping at heavy rain, but still). The other day this came in the mail as part of one of those (usually useless) value-pack type things of coupons for area chain businesses and Chinese food places. Now, it’s no secret that marketing, like basically all media, deals primarily in dominant cultural ideas. TV commercials for cleaning products depict women as household managers who cook and clean (seriously, try to think of a commercial that shows a guy mopping a floor), acne commercials target teenagers anxious to be popular, and weight loss commercials exploit people’s deep longing to fit mainstream models of beauty. But nowadays marketing doesn’t just want to appeal to our inner hegemony — they want to reach the niche markets of the subcultures: nerds, punks, asexuals, aspies — you name it. So now we’re stuck with Burger King’s subservient chicken, the Red Cross tweeting about “Tiger Blood,” and a whole host of other viral/subversive/annoying marketing campaigns all vying for the attention of alternative and youth culture. Which brings me back to this flyer, which namechecks geek touchpoint ST:TNG both in the catchphrase and in the image of the pretzels hanging, like a Borg Cube, in the space of a blue background. It is clever, but I can’t help but feel that behind it is some executive in a Porsche rattling off ways to appeal to the nerds he made fun of in college. Conclusion: It kind of made me laugh, but it also made me think that marketing should stick to irritating the mainstream culture, or at least come up with a less dated cultural touchstone for nerds. What’s wrong with Dr. Who or Torchwood? Like most pizza boxes that come into my possession, this one spent a few weeks traveling around in the back seat of my car before getting photographed and recycled. As a result, I can’t quite remember where exactly it came from, but it’s pretty safe to say it probably originated from an unfussy roadside place in either New York or Massachusetts. Visual Assessment: The Italian stereotype and generic product claims make this box fall squarely in the “classic” style. Oddly, the printing has a bit of pixelation-y cragginess to it, marking it as a relic of the early digital era. Rating: Hmm, I don’t know — this one’s on the edge for me. It isn’t my favorite, but it’s definitely got the generic product claim down and the spare design is kind of striking. I’m going to give it a win. The other day I received what I consider one of the strangest direct mail pieces I’ve ever seen. 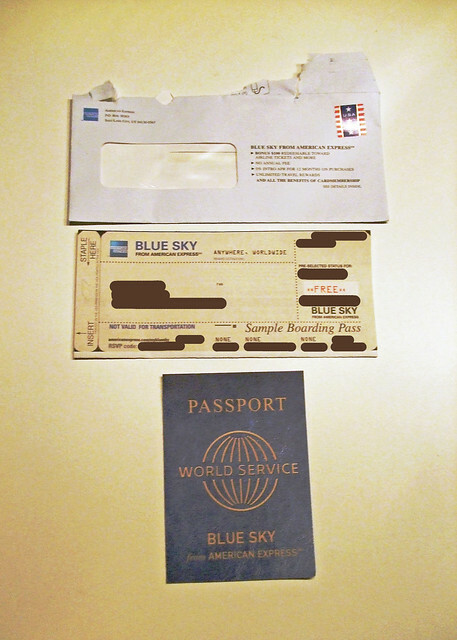 An unassuming white envelope contained an unsolicited credit card application done up in a travel theme — replete with a very convincing looking boarding ticket and goofy fake passport book containing one of those plastic your-name-here credit cards. Conceptually I get it — “oh, the places you’ll go” and all that — but what really throws me is the unbelievable amount of design used in executing it. (Some text redacted, but trust me, even the fonts look perfect). I guess now we know what all the BFAs out there are doing for a living. You can’t help but admire the level of attention to detail. It may not be fully captured by the photo, but the bogus boarding ticket looks and feels really real. For a split second after opening the envelope, I thought it was (before I remembered that I hate going places). 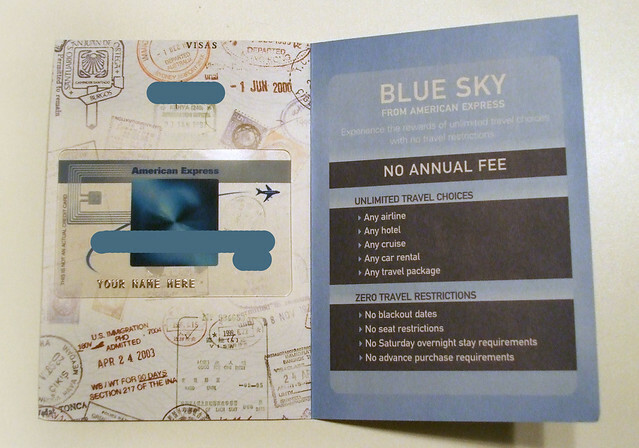 The passport book lacks the thick and vinyl-y feel of the real thing, but the overall effect is the same. It reminds me of the first time I ever saw a fake ID, courtesy of an older brother who had recently returned from a trip into the city. To a ten-year-old in the pre-Photoshop days, it was simply unbelievable that someone could make something like that themselves. I was sure the guy who produced it was some sort of crazy savant who, in his spare time, made rocket ships out of old beer boxes. Sure, basically everything we touch crosses the desk of a graphic designer at some point — even the boring gray boxes and text of the usual credit card application – but the amount of work behind this single, disposable, probably completely unwanted piece of mail is staggering. Just imagine all the executives, marketing strategy people, designers, copywriters, printers, and mailhouse workers, each working on just a small aspect of this thing — not to mention the data and business analysts involved in deciding whether or not it was successful. When you take all that into account, it seems like the only way this could make any kind of business sense is if it were compared to the marketing effectiveness of burning $50 bills in an open pit. But there’s a grimmer message here still. Many of us have accepted the notion that the arts are a luxury that we simply can’t sustain, and that – at the end of the day – we simply have to do what sustains us. What makes money. But it’s not true; there’s art all over the place. It just comes with 20% APR and no annual fees.